My love for Akron runs deep. It’s where I went to school, got my first real job, and met my husband. It has the best people, best parks, best burgers, and best basketball player(s)…but obviously I’m partial. Honey? But don’t you get that on a farm? Surrounded by cows and flower and nature? Surely not in an urban center full of houses and shops and businesses? Never fear, dear reader! I too, had these questions. And we’ll get to them, in a moment. Just not before I get to give you my typical longwinded and overly complicated assessment of the situation. My husband works in Akron, and because he’s quite literally the Best Person Ever, he goes for walks on his lunch break and procures items from local businesses and surprises me with said items when he comes home (trust me, I know I’m spoiled rotten). (And I’m sure you’re surprised I have a petty bone to pick with an entire food group). Like most good Midwestern children, there were few things in life that I looked forward to more than a Chicken McNugget Happy Meal. Because my mom was generally concerned about my health and wellbeing, I was only afforded this pleasure about once a week or so. But during those occasions, my life was pure bliss. I simply cannot express the joy I felt dunking those little boot-shaped pieces of processed delicacy into the accompanying dipping sauces – I savored each moment! Although many children my age experimented with several different sauces, I was a ride-or-die BBQ sauce kind of gal. As far as I was comcerned, this was the only real choice, and I never switched. NEVER. I was brand loyal. One day, I just happened to be chilling with a friend when much to my delight, I discovered the prospect of fast food was more readily accepted in her household than mine, and before I knew it, I was on my way to Nugget Heaven. As we pulled around to the drive-through window and I got ready to request my tried and true BBQ sauce, I was interrupted by a horrifying sound – the sound of my friend ordering honey dipping sauce. Naturally, I was thoroughly and utterly appalled, but because at age six I already understood the importance of conforming to social norms to build healthy relationships with others in my peer group, I too orderd the honey dipping sauce. I dunked my nugget, took one bite, and my life has never been the same ever since. I’m not sure if it was the chicken nuggets themselves, or the undoubtedly low-grade honey, or the combo of the two. But I’d never experienced anything so horrifying. Regrettable. Awful. Deplorable. Thoroughly disgusted, I never really had too much to do with honey from that day forward, because I assumed I just didn’t like (but in reality, it’s because NOBODY should be dipping nuggets in honey. Not even a six-year-old. Bleh). After that first experience, I dabbled with honey every now and again, but always indirectly. 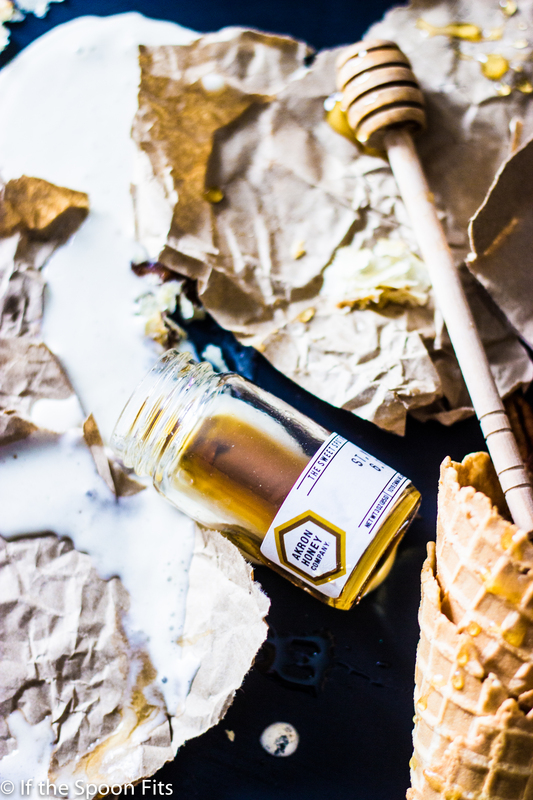 For me, honey was never the star of the show…it was always the trusty sidekick in stable marriages like honey mustard, honey Sriracha, or honey peanut butter. I’ve always wanted to love it, I really have. I mean, Winnie the Pooh eats honey exclusively and he’s so excited about it he can’t even wear pants, so it MUST be good. But alas, the joys of a honey-rich existence escaped me indefinitely. And here I suddenly was so many years later, standing in the middle of my kitchen at the cusp of this major honey crossroads. Hesitant, I licked a little honey off of my finger, and I was completely and utterly floored. 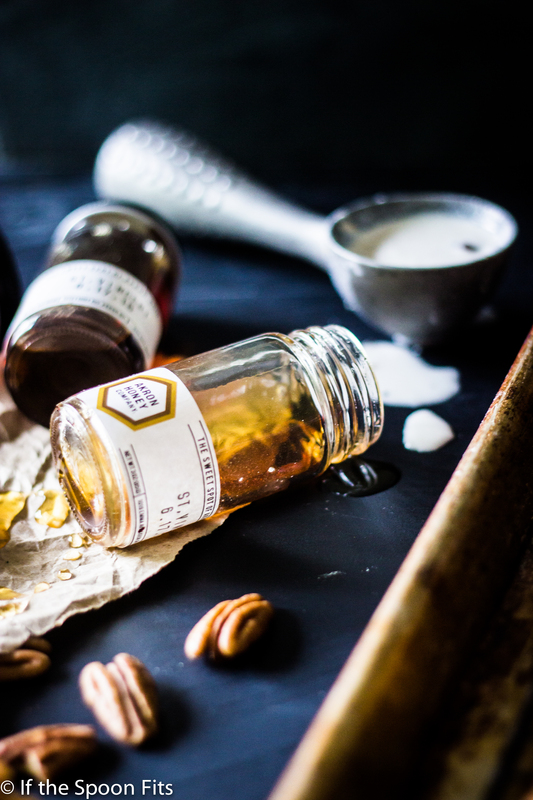 It was unlike any honey I had ever had before – it had this rich, amazingly floral, almost savory flavor. Before I knew it, I had entered into a magical world of honeyed perfection as I devoured spoonful after spoonful. As I started researching the Akron Honey Company and learning more about its background, I fell even more in love. The company’s apiary is smack dab in the middle of an (extra)ordinary Akron neighborhood, on a plot of land that was previously abandoned (hence the term “urban” honey. See? I told you I’d answer your questions eventually). Rather than harvesting a bunch of honey at one time, the owner employs a microbatching method, meaning he harvests the honey in small batches (hipsters, take note of my use of the term microbatching). Aside from producing an amazing product, this company’s mere existence is contributing to the greater good of Akron – they’re out there making a difference, demonstrating that all it takes is hard work and a novel idea to make a huge impact on a city and its people. 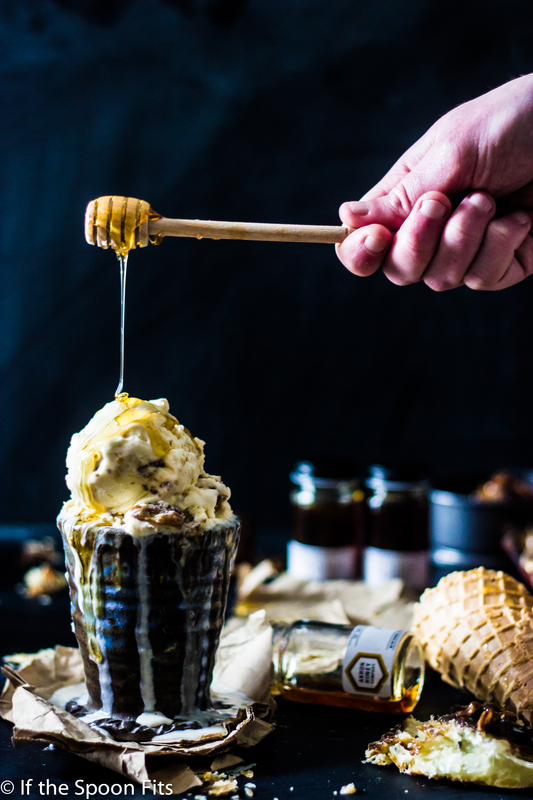 I was hooked on this honey, and knew I needed to pay tribute to this awesome product with a similarly awesome ice cream concoction. I nearly crumbled from the pressure: do I go with something heartbreakingly hipster but slightly overdone, like a honey lavender or honey vanilla? Or do I go with my gut and make something ridiculously gluttonous? You can probably judge from the title of this post that instinct won out. I’m a huge fan of honey butter (another stellar honey marriage), but honey butter alone didn’t feel special enough. As you guys know, I tend to prefer ALL THE THINGS in my ice cream, so I went a wee bit overboard and made homemade sticky buns then smashed them into a delectable swirl. 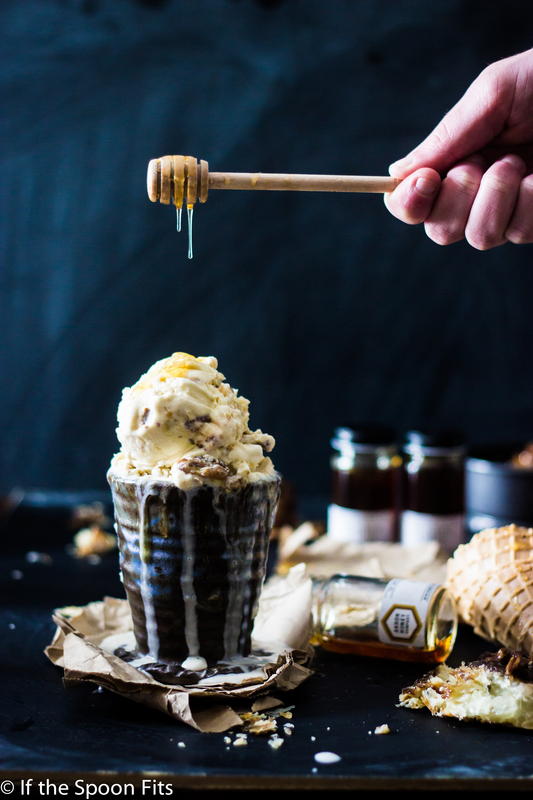 This part totally isn’t necessary – just the honey butter ice cream is fantastic on its own, but the sticky buns add a layer of texture and interest to the finished product. The result? 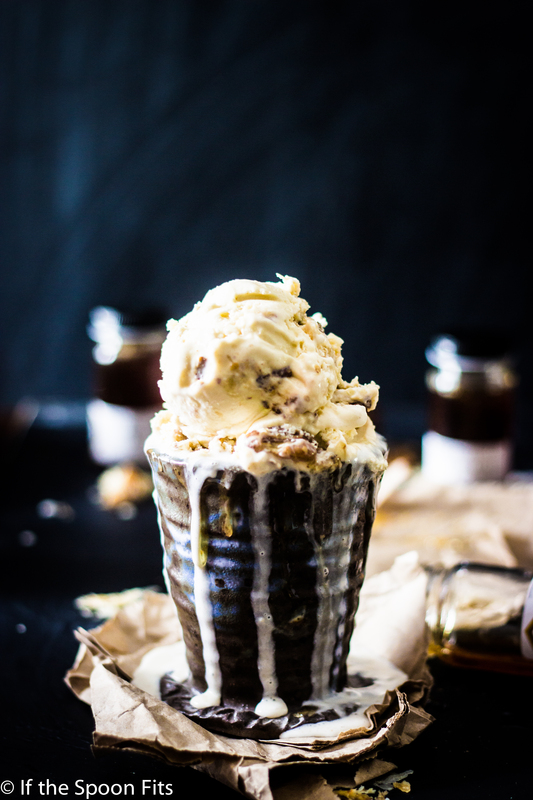 A honey-licious (which may or may not be the title of my future autobiography) ice cream that’s equal parts chewy, sticky, salty, and creamy. With an extra hit of honey drizzle at the end, its the ultimate in comfort food. I’m pretty annoyed that it took me this long to realize the joys of truly good honey, but I’m very much looking forward to making up for lost time this summer. Urban honey? That’s where it’s at. (Just not with chicken nuggets. Never that). In a small saucepan, melt the butter over medium heat and continue to cook, stirring frequently, until it bubbles constantly and turns a medium to dark amber color (about ten minutes). Pour through a strainer into a small dish and set aside. Combine egg yolks and sugar into a medium sized bowl and whisk vigorously. Whisk in your browned butter from Step #1 and set aside. In a medium saucepan over medium heat, heat the cream, milk, and salt until it just begins to steam, being careful it does not reach a simmer or boil. A little at a time, pour the warmed cream mixture into the yolks, whisking constantly until all of the cream is incorporated. Pour the warmed yolk mixture back into the saucepan, and continue cooking for ten minutes or so, stirring frequently, until the mixture thickens into a custard (if using a wooden spoon or rubber spatula, the custard should stick to the back; when you wipe your finger across, there should be a clear “path” through the custard). Once finished, strain your custard through a mesh sieve into a bowl or storage container. Stir in honey. Once combined, store mixture (covered) in the fridge until thoroughly chilled, preferably overnight. 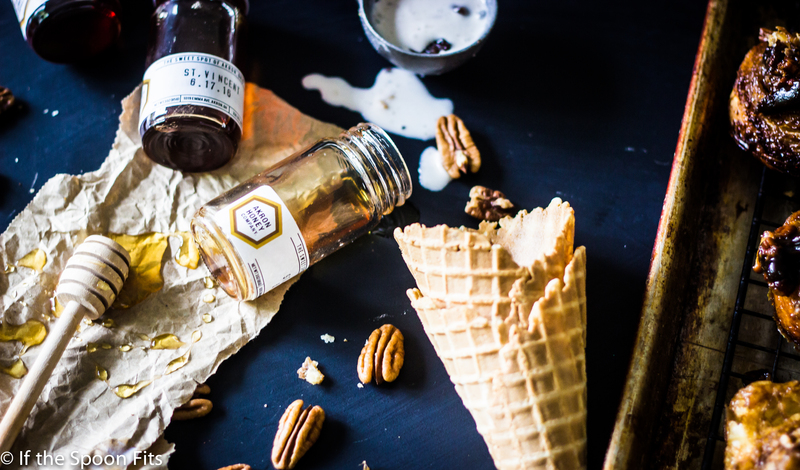 The next day, before churning your ice cream, be sure to taste the mixture and add more honey or salt if desired. 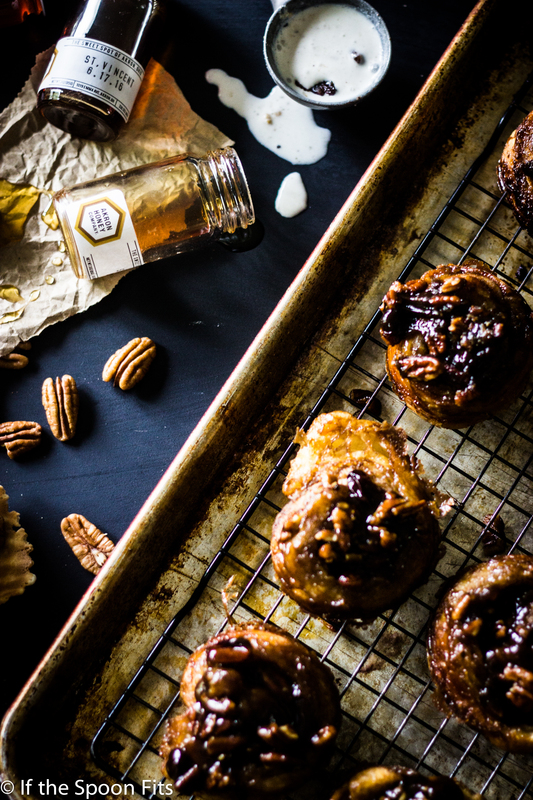 Option #1: Find a sticky bun recipe that you love already, and make them! 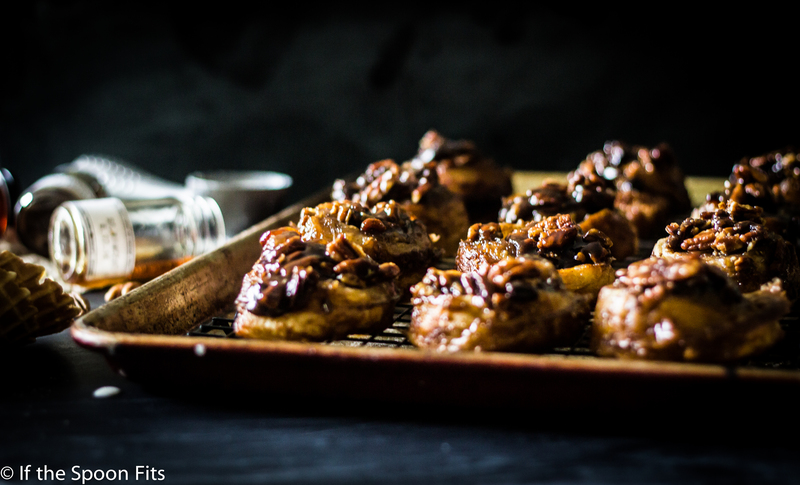 Option #2: Buy some sticky buns at the store! Option #3: If you’re like me and you just CANNOT handle dough/pastry creation of any kind but you still enjoy baking, make these ones that use store-bought phyllo dough. I know what you’re thinking, but let me stop you right there – because they’re amazingly delicious and so easy even an ice cream blogger can make them. 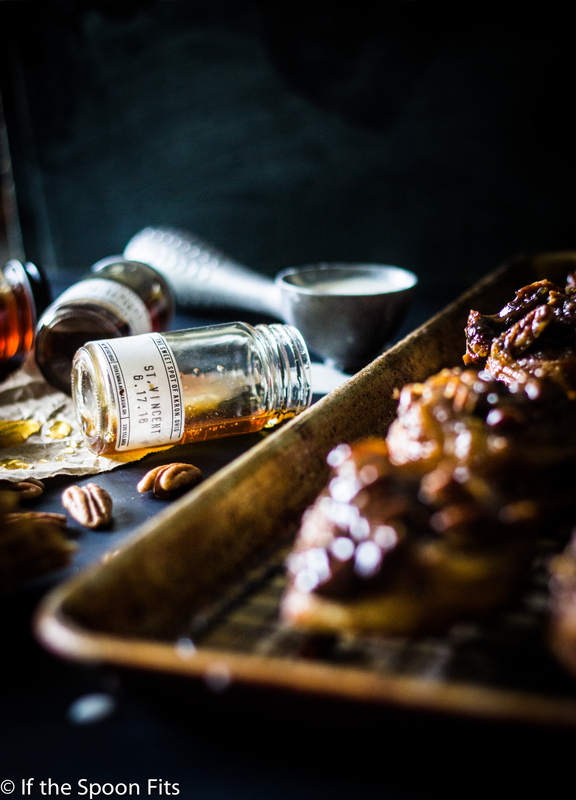 Once the sticky buns are in your possession, eat one (or two), and then roughly chop a few of them up. Drizzle with extra honey, smash them around a bit, and set aside until ready to use. Freeze the Honey Butter ice cream base in your machine according to manufacturer’s instructions. 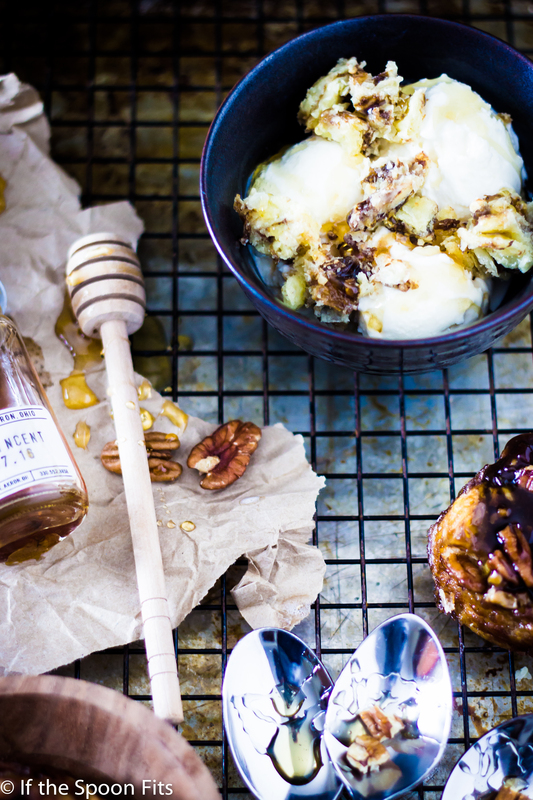 In your storage container of choice, layer ice cream, then chopped sticky buns, then more ice cream, etc. until your container is full. By taking the time to layer the ice cream like this, you’ll get a true swirl pattern once you scoop the finished product. We were just talking about you today at work wondering when your next post was going to come out. Looks delish! OMG this sounds sooo freakin good and I’m so happy you’ve come around to real honey! The idea of dipping fried chicken into sugar syrup (Im sure McDonalds honey is mostly corn syrup) makes me want to vom as a 34 year old, so I can certainly understand why a 6 year old wouldn’t be into it haha! Also, get ready to have your mind blown even more when it comes to urban honey! NYC legalized beekeeping in the city limits several years ago and there are TONS of apiaries all over Brooklyn. Because of limited space though, most of our beekeepers keep their hives on rooftops! We actually sell local rooftop honey where I work! The color and flavor totally changes depending on the time of year too, because the bees are harvesting different pollens from different plants at different times of year. Its sooo cool! Almost immediately after I posted this, my best friend texted me and was like “um, honey was my favorite dipping sauce for nuggets when I was little…” We’re trying to overcome our differences, but seriously..so gross!